Criticism, the first of Dr. John Gottman’s Four Horsemen of the Apocalypse, has been shown to be one of the four highest predictors for divorce along with stonewalling, defensiveness, and contempt. Criticism plays its role in every relationship to some degree; however, there is a point where a significant amount of criticism takes a severe toll on a romantic relationship. In most cases, it starts out pretty minor and escalates over time to include destructive elements such as name-calling, attacking the character of your partner, blaming, and belittling. These forms of criticism are an easy way to attack when we feel hurt, but aren’t the most effective strategy as they trigger defensiveness in the other partner. Rather than using criticism to attack, there are other strategies Dr. Gottman recommends that will lead to better communication and a healthier relationship dynamic. Below are a few ways to challenge criticism in your relationship to make it healthier and more successful in the long-term. It is normal to have things about your relationship that bother you or make you unhappy, but attacking your partner’s character is the wrong approach. Rather than attacking with criticism, try directly stating what is bothering you without blame. For example, your partner may be late for dinner with your friends and you may want to say “You are always late and it’s so annoying”. An example of a gentle startup for this scenario would be “It is important to me that we are on time, can you try to leave earlier next time?” Gently getting across a need or desire without harsh criticism will allow your partner to respond more positively and facilitate a healthier conversation. Oftentimes, criticisms begin with “You never” or “You always”. These “You” phrases imply blame on the other person rather than getting across the underlying message. Try using “I” statements such as “I feel sad when we don’t eat dinner together” or “I miss having regular date nights” as they lack blame and meanness. They make the conversation more about the underlying issue rather than making it a blame game. It is important to ask yourself how you are feeling and what you need from your partner in this moment to formulate the best “I” statement possible. 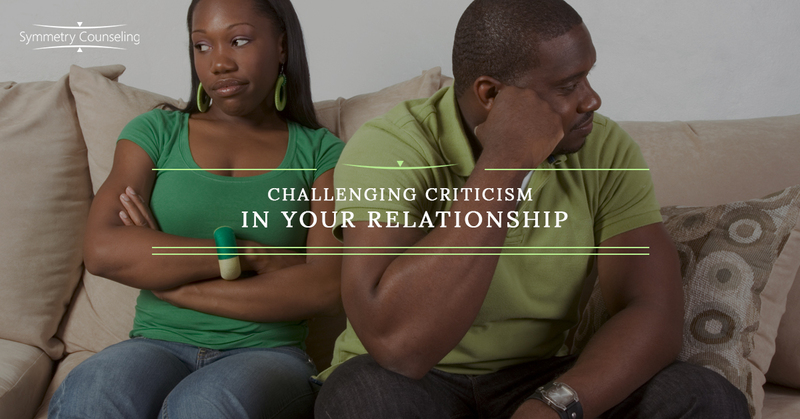 Challenging criticism in your relationship doesn’t happen overnight. It is going to take a lot of practice to put some of these strategies into place consistently. If you find yourself using criticisms in your relationship, it is important to acknowledge them and apologize to your partner for being harsh and critical. Showing that you are aware of the criticism and that you are making an effort to change it is a great place to begin. Also, be kind to yourself if you are having a difficult time controlling it. It will become more automatic the more you make an effort to challenge the criticism in your relationship and remain consistent. If you have identified criticism in your relationship and would like some support, it may be useful to connect with a therapist. Contact Symmetry Counseling at 312-578-9990 to set up an appointment with one of our very skilled therapists today!